Spend your holiday in a well-maintained accommodation with lovely ambience and excellent value for money. The holiday home is situated at ground level on the bottom floor with its own entrance. From here you have direct access to a private terrace with garden furniture and the small but pleasant garden. 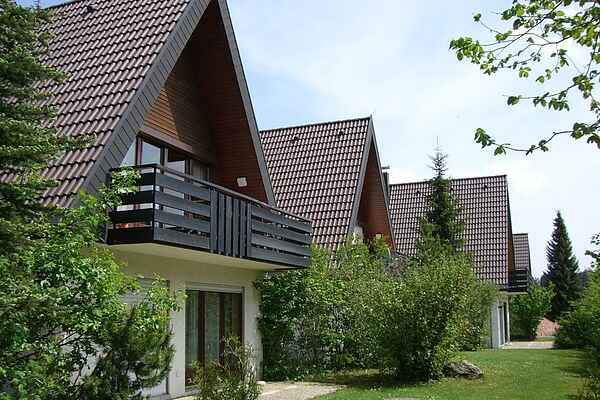 The home is located in a quiet holiday complex with no road traffic, right at the edge of the forest and surrounded by meadows and woods. It is situated in the southern Black Forest, centrally located between Freiburg, Basel and Zürich in the middle of the tri-border region. There are many daytrip destinations within easy reach from here, such as the Titisee, Lake Constance, Rheinfall Schaffhausen, Feldberg, the Schluchsee and the Belchen. This well-known and popular holiday region offers good traditional cuisine of excellent quality. An extensive network of hiking and biking trails, suitable for a wide range of recreation options, leads throughout the area's natural scenery. There are even old castles and an adventure playground to explore. In winter, there is a great sleighing hill right here in the complex. There is also a network of cross-country ski trails.